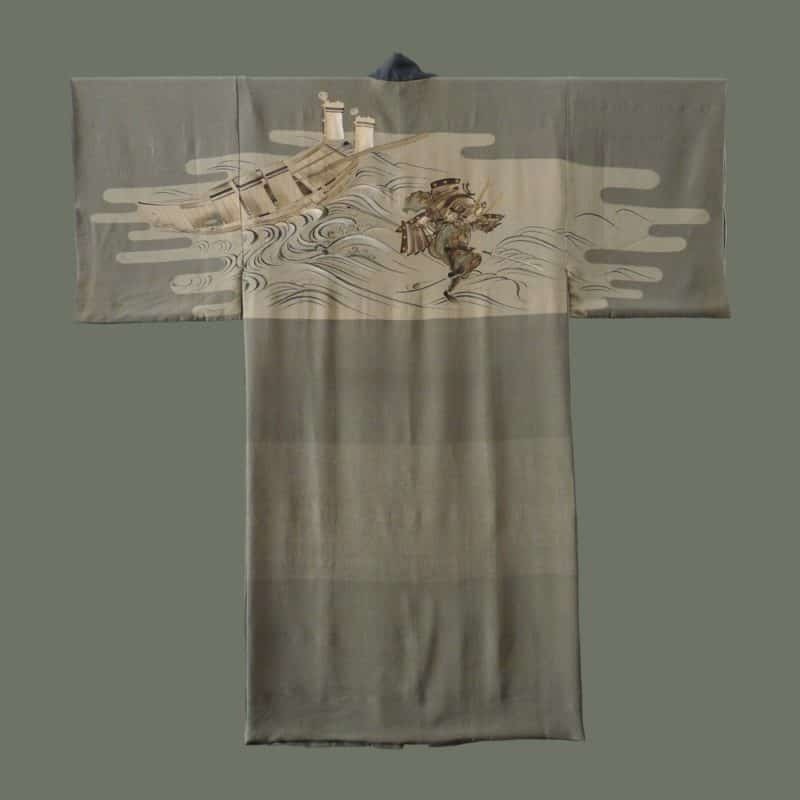 Made of fluid, textured, matte grey green silk crepe, this man's 'juban', or underkimono, has a beautiful hand-rendered painting on the upper back of a samurai warrior walking on water beside his small boat. The lower part of the garment is patterned with a subtle design inspired by tortoise shell. 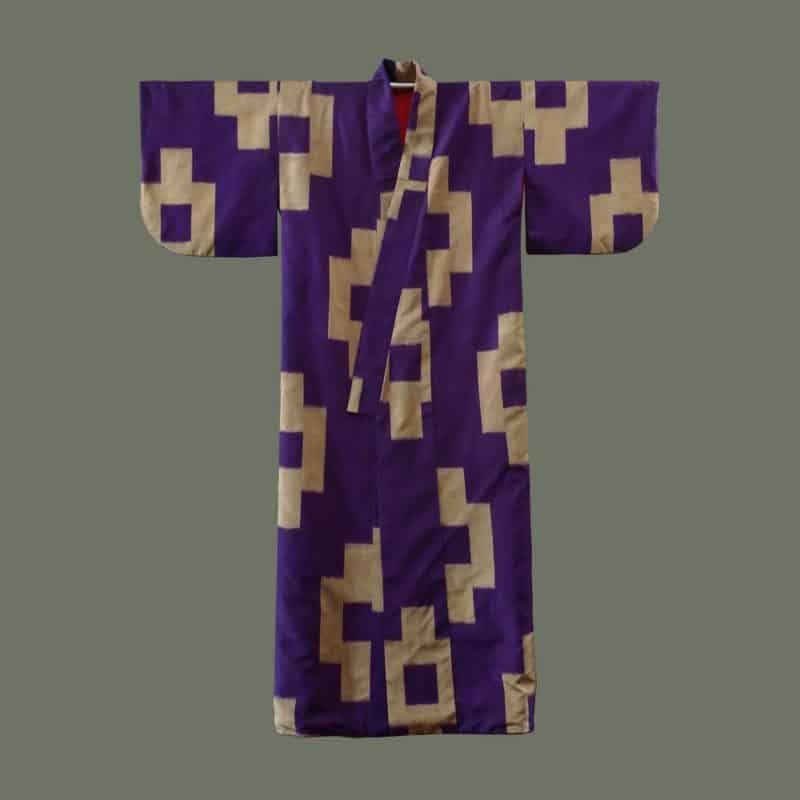 Intended to be worn under a man's kimono, this is a wonderful example of 'uramasari', or the use of a colorful or fanciful lining, or undergarment, with an understated outergarment. We think this would be beautiful displayed on a wall. 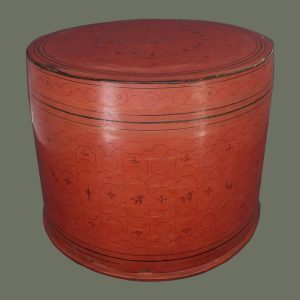 As an antique piece (possibly Taisho Era 1912-26, or maybe earlier) it has some age patination and stains (see details), which do not detract. Overall it is a fascinating and beautiful work of art from a previous era. Size: 50 in. h x 51 in. w across shoulders. 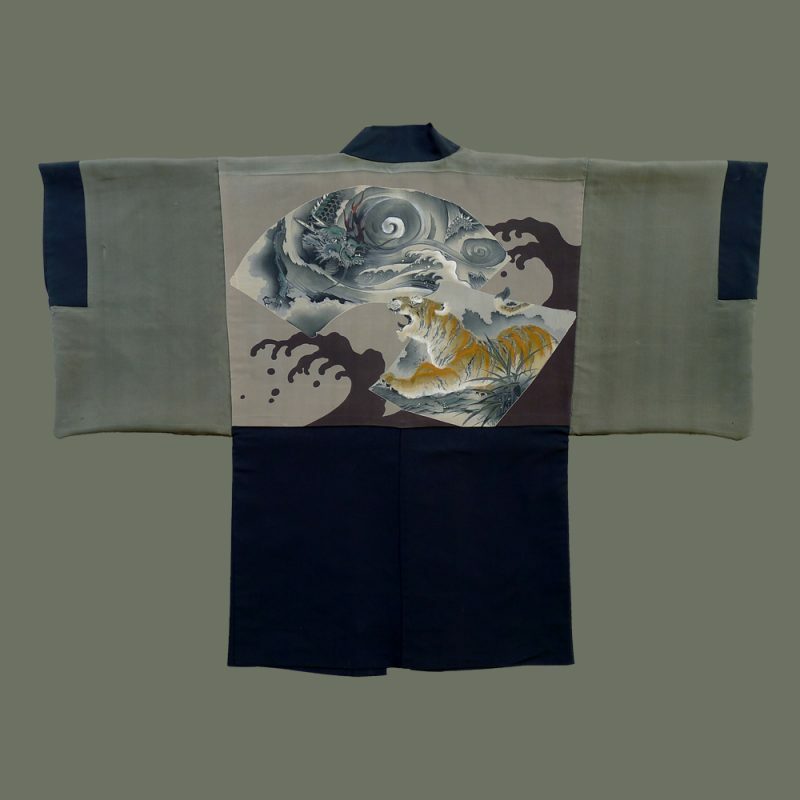 Made of lightweight, matte black silk, this formal man's 'haori', or jacket has a surprise in the lining: a lively, dyed painting of a dynamic dragon and a roaring tiger surrounded by crashing waves. The rendering is skillful, as is the dyeing, and actually looks like painting. The composition is very artistic and full of fine details. This is a wonderful example of 'uramasari', or the use of a colorful or fanciful lining, or undergarment, with an understated outergarment; most often this is a feature of men's garments. We enjoy wearing these textiles with the lining on the outside, or displaying them on a wall. This is a vintage piece and is in excellent condition. 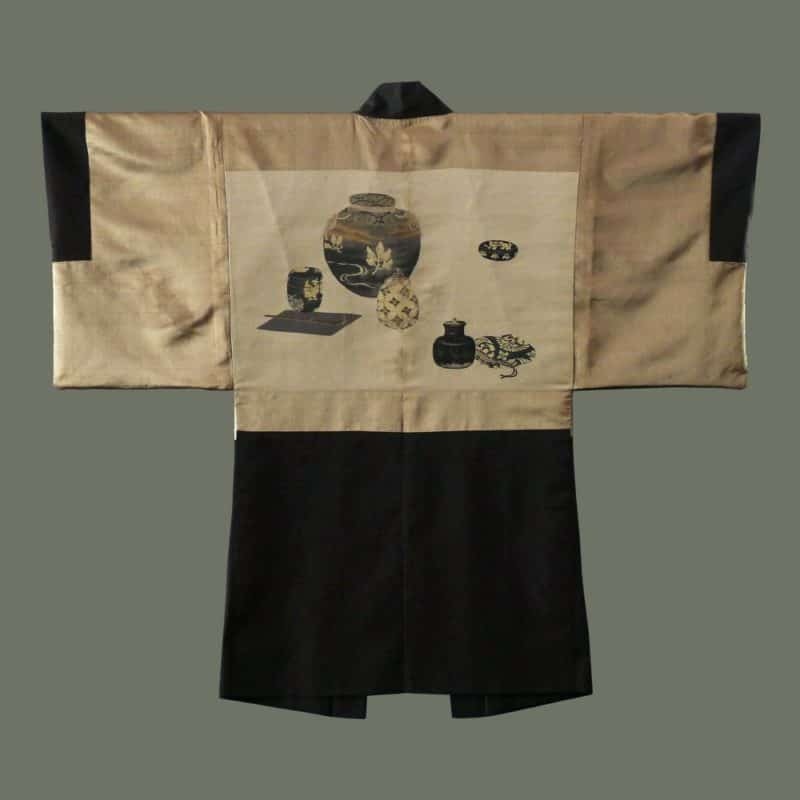 The somber dark brown silk on the outside of this man's jacket belies the rich inner lining: a tableau featuring a collection of tea ceremony items is finely woven in silk, including metallic threads, on a golden satin silk background. The details are quite fine and beautiful. This a good example of 'uramasari', or the use of a colorful or surprising lining, or undergarment, with an understated outergarment; most often this is a feature of men's garments. 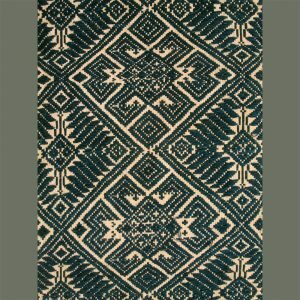 We enjoy wearing these textiles with the lining on the outside, or displaying them on a wall. This is a vintage piece and is in excellent condition, with only a small stain on the lining and a pulled thread (note: what appear to be stains around the center seam are a distortion from the light on the silk). 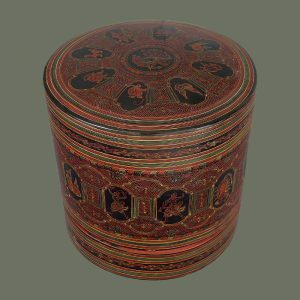 This would be a great addition to a collection of Japanese vintage textiles, or for the collection of a tea ceremony fan. Size: 41.5 in. h x 53 in.w across shoulders. 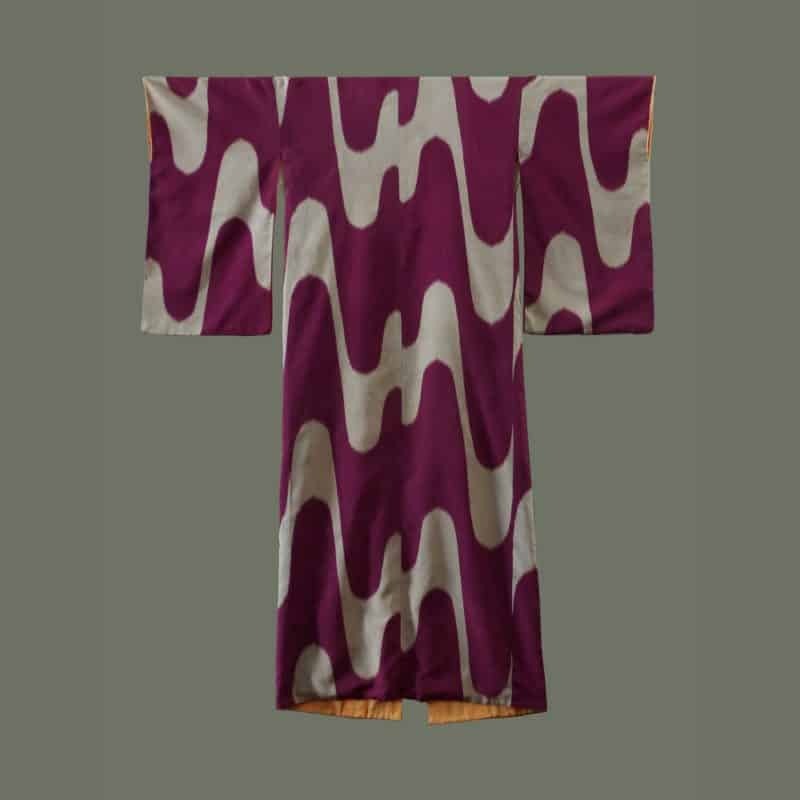 This bold kimono has large ikat patterns in champagne gold on a rich purple background, with red accents peeking out from the sleeves and hem. The subtle sheen of the silk heightens the richness of the simple pattern. These bold, modern looks were especially popular before and after WWII. 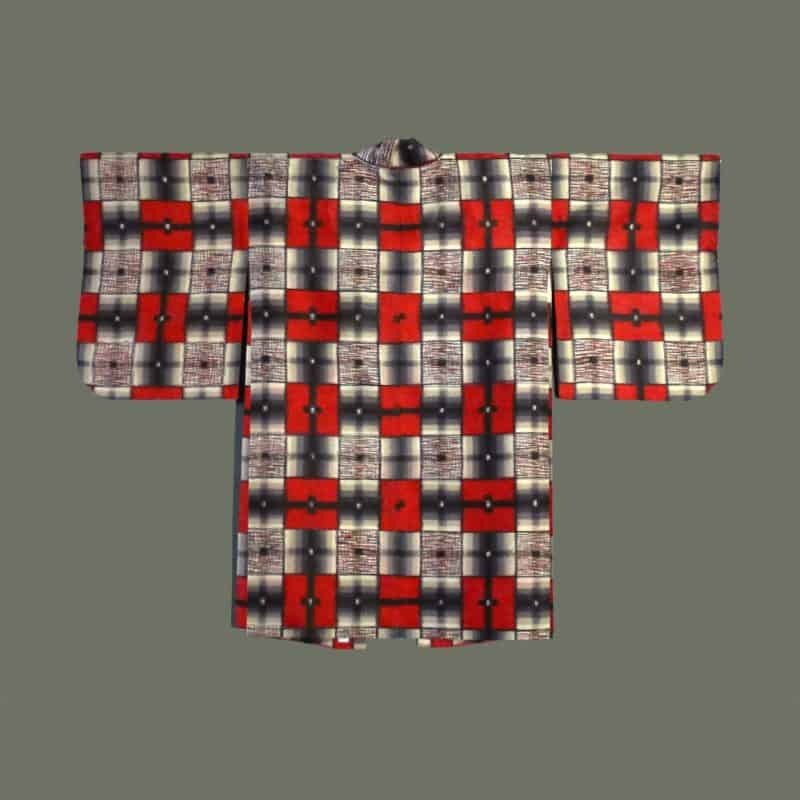 We think this kimono dates to post-war because of the sleeve length, which is shorter than pre-war kimonos (see TAJ127). Condition is excellent. These modern pieces are especially beautiful displayed on a wall, but this one could also be worn. Size: 57 in. h x 48.5 in. w across shoulders. 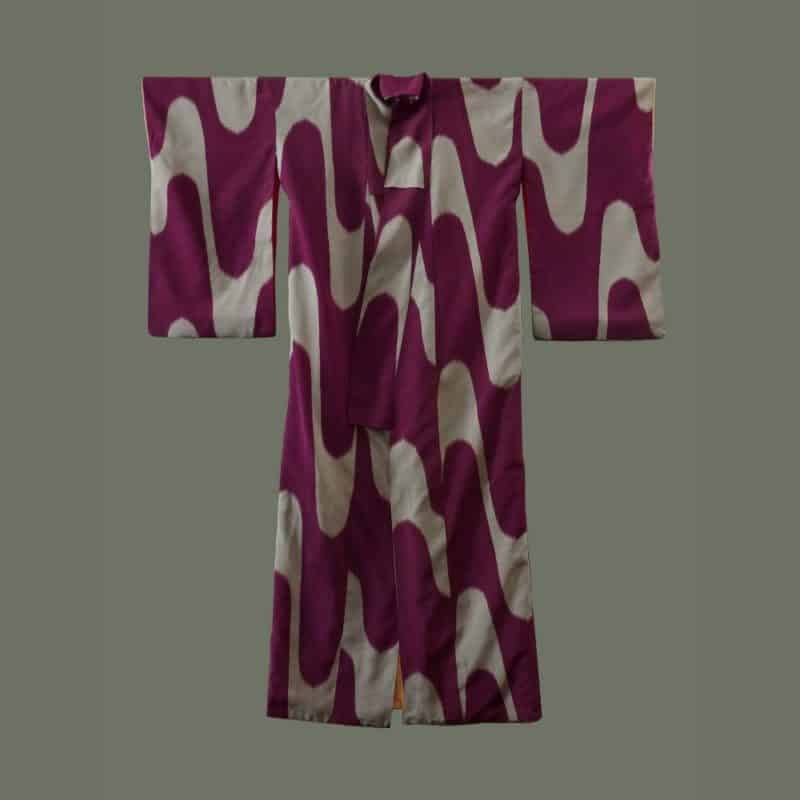 Very modern in its style, this kimono features a large ikat wave pattern reminiscent of Central Asian ikats.The flowing silk is a subtly shimmering crepe with pale grey motifs on a raspberry background with peach colored silk accents peeking out from the sleeves and hem. 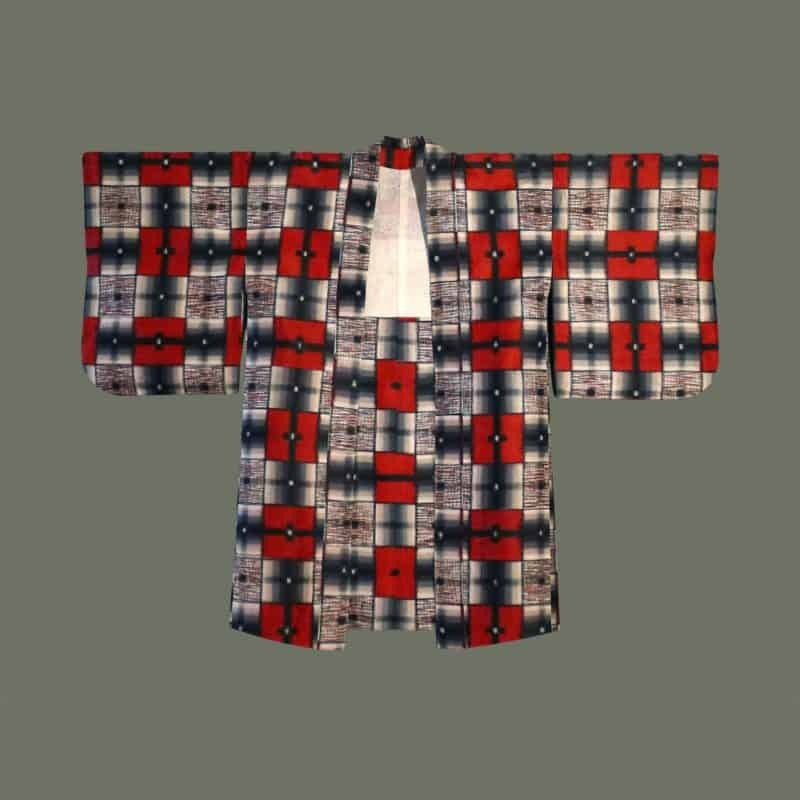 Though modern in design, this kimono is probably pre-WWII, as the sleeve length is quite long. Condition is quite good, although there are some loose threads, stains and one repair. It is best enjoyed displayed as modern art on a wall. Size: 60 in. h x 51 in. w across shoulders. 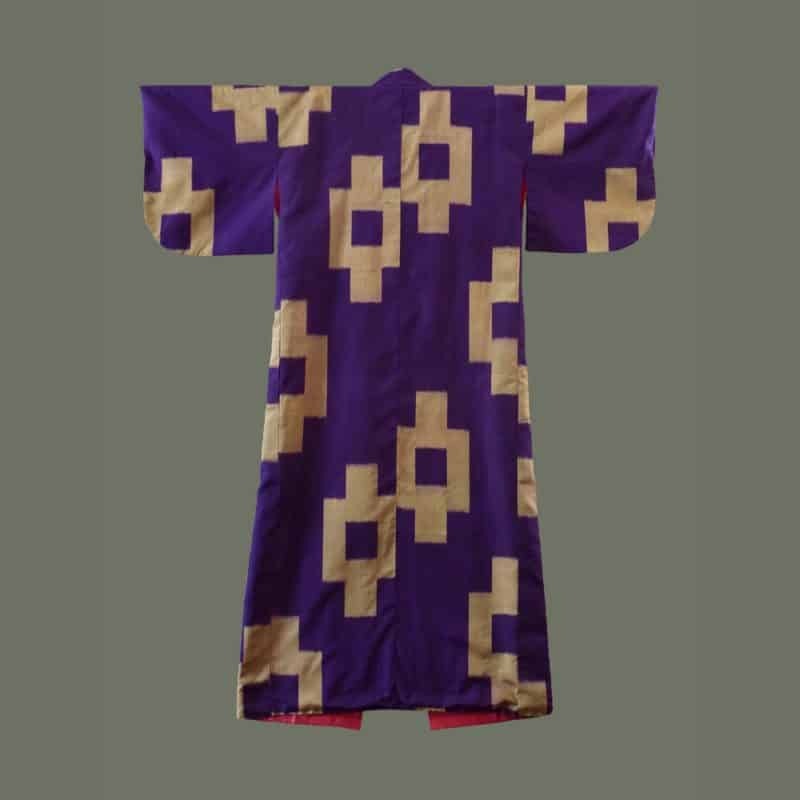 Boldly patterned, this older haori is woven using the 'meisen' technique to create an 'ikat' look with the desired blurring of the motif edges. This technique was popular from the 1910's through the '50's and used mostly for graphic, modern designs. 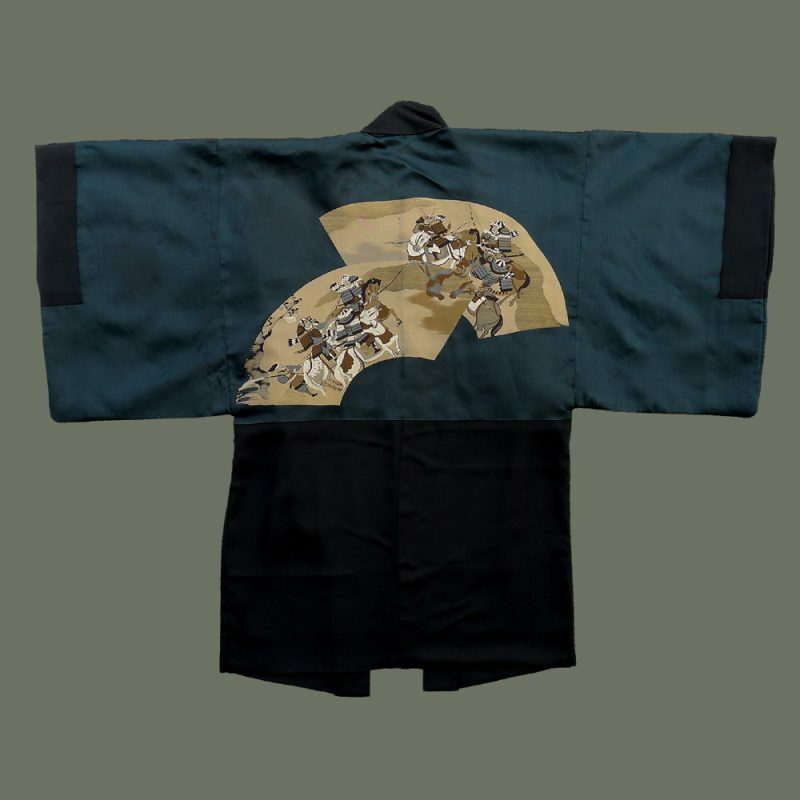 This haori, or jacket, is longer than most and can be easily worn, or displayed on a wall. 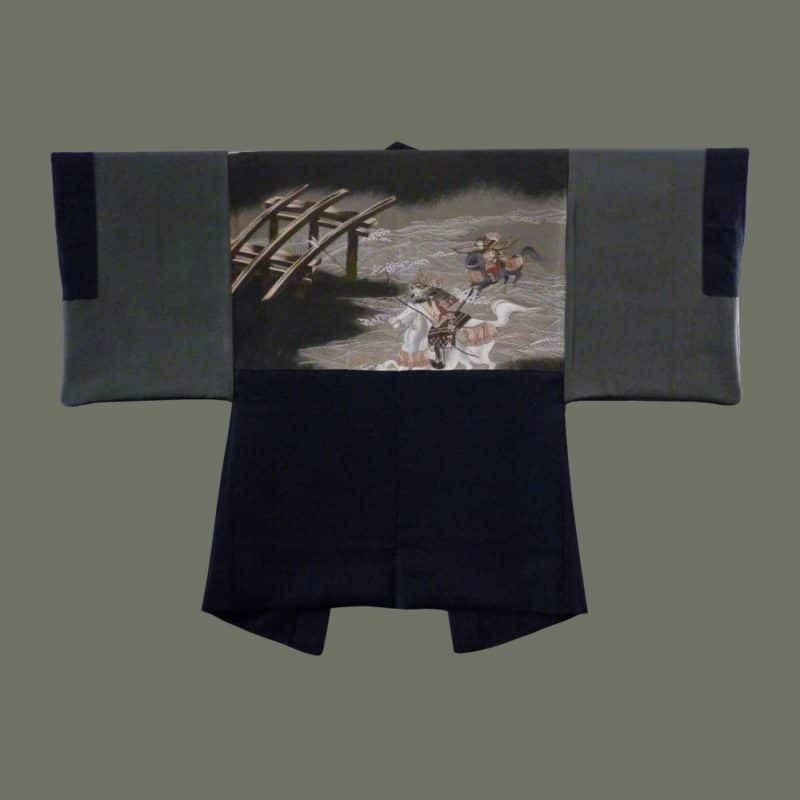 The silk is a bit stiff, as is typical of meisen pieces, but is not heavy; the silk is two layers thick on the lower half, and there is a lining across the upper back and in the sleeves. Condition is excellent. Size: 36 in. h x 49 in. w across shoulders; 22.75 in. across back. 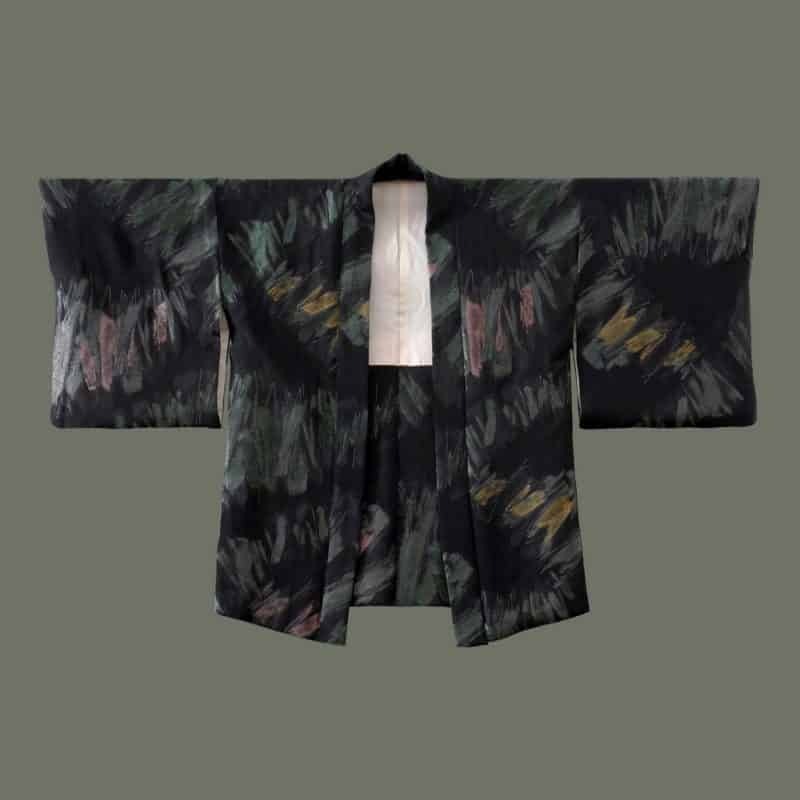 Fun and elegant, this woman's haori, or jacket, is enlivened with modern splashes of green, pink and gold foil threads, over black splashes on fine black silk. These are woven, not dyed. 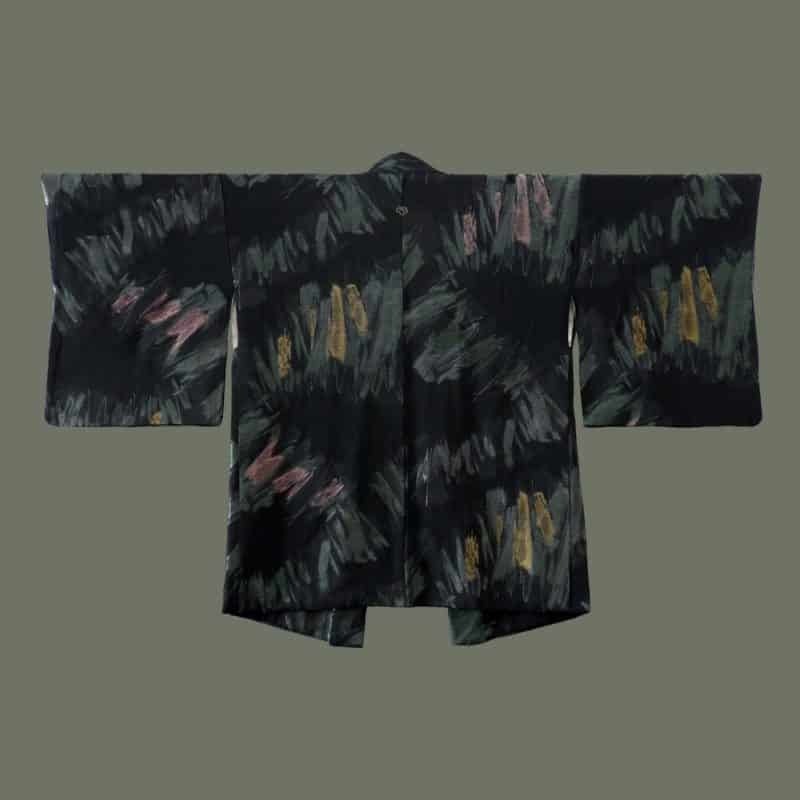 An elegant lining of soft silk with a woven 'sayagata' pattern has softly-colored dyed clouds as an overlay. Attractive silk ties complete the look. Condition is excellent. This would be lovely to wear for special occasions or even to dress up jeans for a fun evening out. Size: 30 in. h x 51 in. w across shoulders; 23.5 in. across back.